Ashelynn Manor was the perfect setting for a reception hall filled with champagne flutes and dozens of roses. 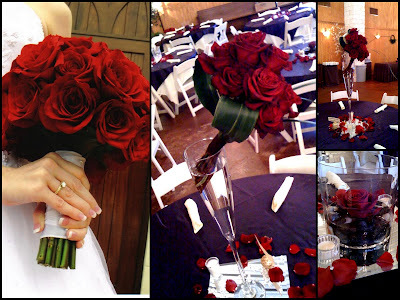 Classic black, white and red is a timeless colorscheme filled with passion and romance. The bride chose 3 different designs for her tables. The first design included a floating Black Magic rose over black pebbles in a clear glass cylinder, the second design included champagne flutes and tilting roses, while the remaining tables had crystal lanterns. All the tables had red rose petals sprinkled around the mirrors. Balance and prescision in perfect form, wouldn't you agree?